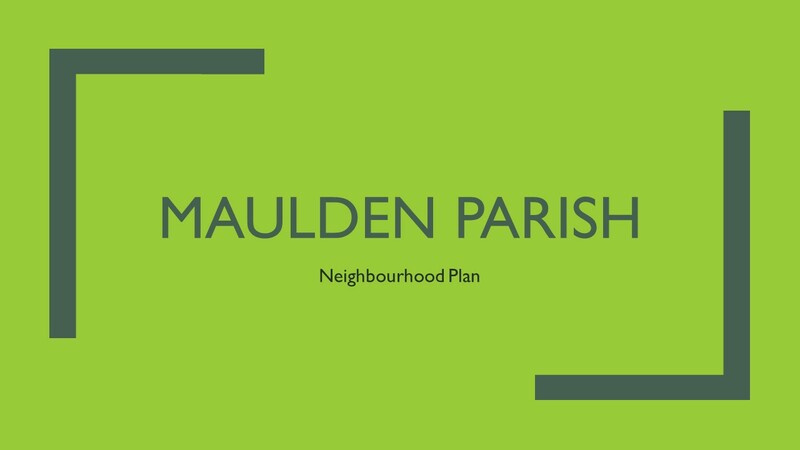 The early part of 2018 will see The Greensand Trust working to produce a Green Infrastructure (GI) Plan for Maulden as part of the Neighbourhood Plan . The GI plan will help shape the future of the parish and secure funding for environmental projects. As part of this survey a public consultation is being held on Tuesday 23rd January 2018 in the Village Hall at 7:30pm. MONDAY APRIL 3rd at VILLAGE HALL. 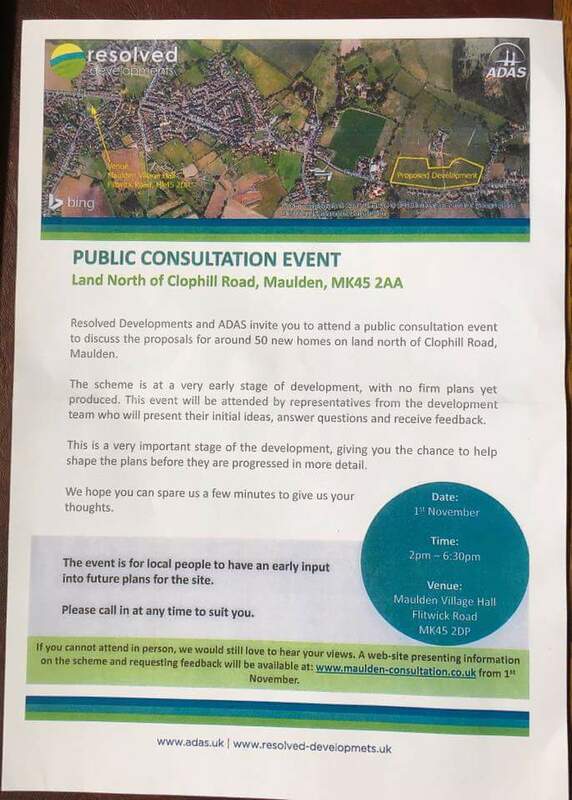 This is your big chance to influence which sites get chosen FOR and AGAINST development in the village. Please come – notices on posts all around the village. Please bring friends, especially younger ones. If you own land put forwards for development, please come along. If you want to see specific things built, come along. If you want to see specific sorts of homes built, come along. The first in a series of public meetings has been scheduled for 7:30pm on Tuesday January 24th in the Village Hall. The presentations are likely to be self-explanatory, but the table walks need a little further discussion. We imagine that working group leads will each staff a table that will have some printed question sheets, and a large sheet of white paper. Each table will be equipped with pens, Post-it notes, and one or two people from working group. As an example, we may have sheets for people to submit the important questions and views that they have. I generally feel it’s important to minimise long written answers, is extremely hard to analyse, or make any constructive use of. They do, however, indicate sentiment. Resolved: Just a brief update, as of 10pm 21 November 2016. Out of a total of 5111 affected properties NG have restored supply to 4719 leaving only 392 they haven’t been able to gain access to in the Ampthill Flitwick Clophill Ampthill areas. This emergency notice will be retained for archiving. A copy of the official notice about the loss of gas is attached to this post. The relevant official sources of information are on the links below. The official source of information is the coordination centre at Maulden Village hall. Information from that site supersedes anything else. National Grid engineers have started to restore people's gas supplies in Clophill, and will be working into the night to do this as quickly and safely as possible. We will have over 100 engineers on site on both Saturday and Sunday to continue the restoration of supplies in Maulden and Ampthill. We hope to have the majority of gas supplies restored by the end of the weekend and will keep you updated of progress. We are restoring gas supplies in stages as this is the safest, and quickest way to ensure that we provide a safe and steady service in all areas. We have over 100 of our employees in the area working extremely hard to bring the gas supplies back to all properties by the end of the weekend. See below – do NOT turn on your own supply until an engineer has called and made your gas safe to use. National Grid is working to repair a leaking medium pressure gas pipe in Flitwick Road, Ampthill, after contractors working on a new housing development damaged the pipe late this afternoon (15 November). The incident has resulted in a loss of gas supply to homes and businesses in Ampthill, Maulden, and Clophilll. Engineers are working to repair the leak as soon as possible and to work on restoring gas supplies to those affected. If you smell gas or have lost your gas supply please ring the National Gas Emergency service on 0800 111 999. To safely restore gas supplies, engineers will need to visit every affected property and switch the gas supply off at the meter.Engineers have already begun switching people off and this operation will continue tomorrow. Please arrange for someone to be at home so we can switch your supply off. The sooner we are able to switch everyone off, the sooner we will be able to restore supplies. Once the repair has been made and gas is back in the mains, a second visit will be made to turn on the supply to each property and make sure it is flowing safely. National Grid is liaising with the local authority to ensure elderly and other vulnerable residents are being identified and cared for. If you know of an elderly or vulnerable resident, please contact us on 0845 835 1111, so we can help them. Every effort is being made to restore supplies as soon as possible. However, it is too early to say when gas supplies will be restored. For more general information on incidents please see our incident page in our safety and emergencies section. A community response has been set up between the National Grid and Central Bedfordshire Council. They are coordinating the proper response to the approximately 6700 houses affected in the Ampthill, Maulden and Clophill area. Oliver Street remains subject to a road closure overnight and CBC have a Highways team to maintain this overnight. This may continue. Please comply with all the instructions from the engineer who visits your property. Please arrange for someone to be at home so Engineers (who carry ID) can switch your supply off. If you are not in, please arrange for a neighbour to have access to the property. Please do not attempt to switch on your own gas supply or relight any appliances. Doing so could be extremely dangerous, and will delay the resumption of full supply to all premises in the area. This means not using boilers, gas heaters, water heaters, gas cookers, gas ovens, or any other mains gas appliances at all until you are told by a National Grid engineer personally that it is safe to do so. You can switch off your gas at the main ECR tap or valve, but National Grid engineers will need to visit and confirm every property. You should not turn your gas back on if you or an engineer have turned it off. There is a higher risk of gas leaks from non-ignited appliances because of the current situation. Please be extremely diligent and respond with reports of the smell of gas or gas leaks to the emergency services and emergency telephone number for the National Grid. There is no current timetable, but it is expected to be several days. You should plan accordingly. Can I use electric heating? Yes, but be aware that 6,000 people suddenly turning on 2 electric heaters and ovens and immersion heaters may overload the electricity grid as well. Caution is advised. For a while, it seems sensible to avoid having too many electric items on at once. If you are fit and well, dress up warm, and keep active if it gets cold. Please allow services and power to help those most in need. Pilings being driven at the Abbey Lane site fractured a high pressure gas main. What are CBC and National Grid doing to help? 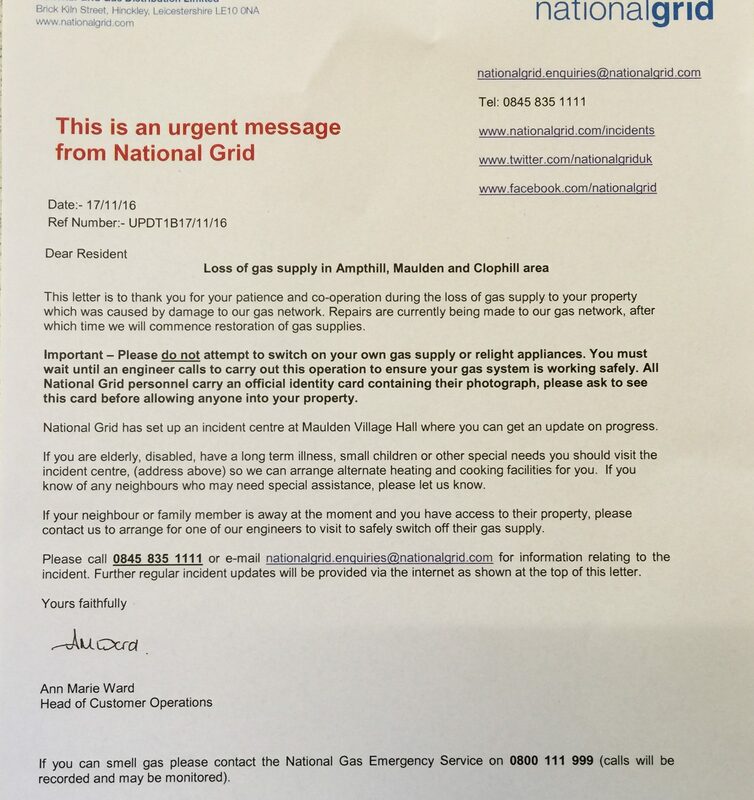 National Grid are putting together information letter for residents affected and will be distributing them. CBC Comms team are aware and will be picking up any warning and informing actions in the morning. National Grid are sending 500 fan heaters and 200 hot plates to the scene for distribution to affected residents as needed. They will be liaising with UK Power Networks to ensure does not cause electrical outages. CBC Have appointed a Vulnerable People Coordinator to identify potentially vulnerable people likely to be affected by the incident, and will be liaising with National Grid to ensure these people are prioritised for assistance as necessary. CBC have set up Maulden Village Hall as an Incident/Assistance Centre and RVP for responding agencies. Liaising with Police and National Grid representatives at this location. We believe it’s especially important that you help your elderly, vulnerable, long-term sick, disabled, or very young neighbours and friends. Please speak to them, and make sure that they are aware of what’s going on. Provision has been made, by way of electrical cooking and heating equipment and other services and support for vulnerable customers. CBC and the National Grid are coordinating this. If you know a vulnerable person but they are unable to get to the village hall. If you can make that trip for them, with their permission, this would be very helpful. Please attend and give fair and reasonable feedback to the organisers. Please also send any feedback you do give to the Neighbourhood Planning team. as well – this will ensure it is also taken into consideration when the full Neighbourhood Plan is available. Sadly the website http://www.maulden-consultation.co.uk/ was not active at the time of posting this article. ADAS is working with landowners to maximise the value of their land by promoting it through the planning process for the purpose of residential property development. We do this by entering into a promotion agreement with the landowner which enables us to progress a planning application and ultimately obtain planning permission. After permission for a residential scheme is granted we will subsequently organise the sale of the land, on the open market, to the highest bidder. This approach ensures that the landowner maximises the value of their land before it is sold, while not risking any of their own money. You can, and should, also make views clear to Central Bedfordshire Council via their Local Planning forum and complete their Growth Options Survey as well. It helps a great deal if a wider view can be taken on the impact on the whole of Central Bedfordshire as well as the specific impact on the immediate area and the village of Maulden. Finally, it is worth considering “what would make this work better”. If there are specific provisions or a contribution to the whole village in some way, what would make the most impact? Development is mainly financially driven unless there is a strong and co-ordinated local and regional response. At present, land with planning permission in Bedfordshire is worth considerably more than land without it. The basic economics of a large development are exceptionally profitable for the land owner, and reasonably profitable for the developer. (A good example is given on this site of how it all works). The site is worth £650,000 t0 £950,000 per Hectare for the owners, using Persimmon Homes figures, and assuming a final density closer to 30~35 homes per Hectare. It appears the suggestion is for a fairly low density site, but, as this village has experienced many times, final densities tend to increase with each amended planning submission. In addition, the developer will recover 20~25% profits on selling (say) 50 homes at an average price of about £350,000 per home (again, using Persimmon Homes figures and their published accounts) or close to £4m. That is after paying relatively small sums of Community Infrastructure Levy and s106 Contribution (these will increase if Maulden has a Neighbourhood Plan in place before permission is granted). Many of you will not think of your Parish Council from one month to the next, but they are incredibly important to the village and how it runs and how it will develop. Please, if you are going to vote, vote for your parish councillors of choice this year in the Maulden Parish Council Election 2015. The more people who vote, the more credible the councillors are and the more incentive they have to really work hard for the whole community. Deliver positive growth and change to the benefit of everyone who lives in it? Create a vibrant local business community that benefits the residents as well as business owners? Enhance the environment of the village and the area around it in a sustainable manner? Consider ways to enhance heritage assets in a meaningful and sustainable manner? Work hard for improved communication and social cohesion? Support our youngest, oldest, poorest and most disadvantaged residents in meaningful and constructive ways? Consider the value of social events in public spaces for the whole village (like Christmas singing, Bonfire night, Summer BBQ, Village Fair)? Improve the safety and security of the whole village and everyone in it? Improve the physical infrastructure, and work with responsible bodies to do so? Use all your powers to deliver those changes? Those candidates who commit to, or have a clear desire to, support those 12 aims should get your vote in the Maulden Parish Council Election 2015, and your support in future. It is worth finding out what they can do (officially) and who they are, so you can write to them or get to know them in and about the village.